Printed from http://www.bodytalksystem.com//learn/news/article.cfm?id=901 on Apr 22, 2019. 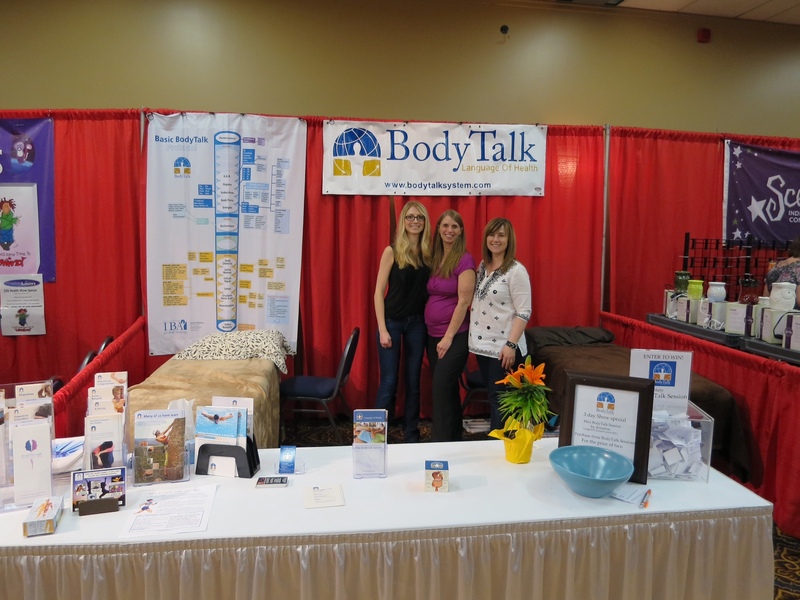 I was recently invited to join this group of women to attend a Health Expo in Regina, Saskatchewan. When I reviewed my schedule, I was booked so unfortunately I had to decline, but offered support in other forms. As the day went on, there was a part of me really wanting to attend. I trusted this feeling and re-arranged my schedule. It had been a few years since I had attended a show, but I was quickly reminded of how participating in such events are so beneficial and inspiring on many levels. As soon as I called to change my original reply, my mind was on fire with ideas, I felt like a part of me got my Mojo back (kind of like Austin Powers). I thought I would share some of the ideas and things we did and how the IBA has many resources available that makes attending these events easy and professional. Display: We used the rack cards which offers several topics to attract the variety of clients to take the information that was molded to their symptoms. We included a few of the anatomy cubes for people to play and read. 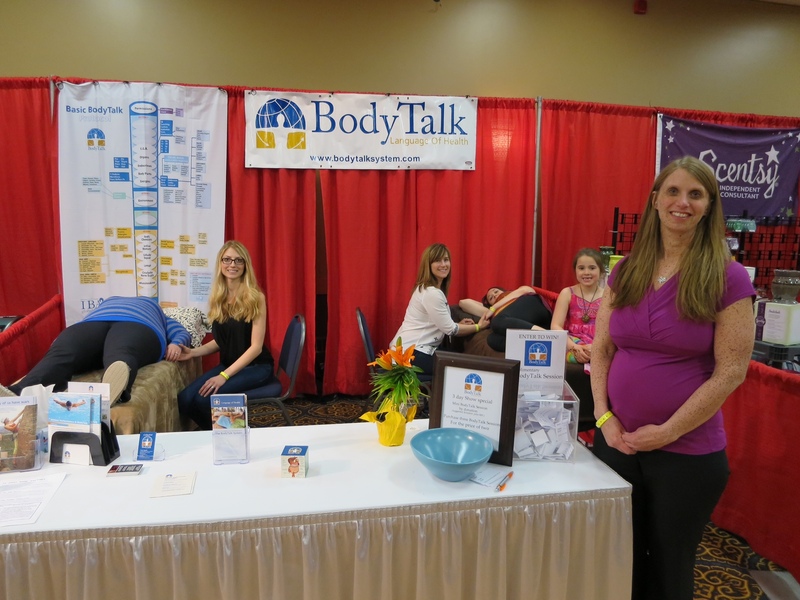 We hung banners behind us which were great for us to refer to as we were explaining BodyTalk. We also had a draw box that people could enter their names for Free Sessions, using the BodyTalk and BodyTalk Access pens for them to fill out the ballets. We added a plant to the display to add some warmth. It was a very inviting display! Speech Time: By the time we booked our booth, all the spaces to present were full. On the first day of the event, I went to the organizer and mentioned to them if anyone cancels or is a no show that we would love the opportunity to speak. To our surprise on the first evening, there was a no show, the space needed to be filled, and we were informed we needed to speak in 10 minutes. In that moment I thought WOW, ask and you shall receive really does work! I had 30 minutes to speak so, with no preparation, I let BodyTalk speak through me and concluded with explaining the Access seminar and teaching cortices. I was then able to hand out a sheet from the I AM Note Pad so they all had the follow-up of cortices to refer to. Demos: We had two massage tables set up to offer demo sessions. There was always three of us at the booth, two doing sessions, and one attending the crowd. We offered the demos for a suggested donation price. We were booked solid doing sessions through the whole expo. We did over 70 demo sessions which covered all of the expenses of the expo, and each person took home a profit! Follow up from Demos: After each demo, we gave clients bottles of water. On the bottles of water, we made a label with 5 benefits of hydration as an education tool as well as to support the drinking of water. Then, we taught each person cortices, and as a follow-up tool, we handed them a reminder of how to tap the cortices from the I AM Note Pads. Door Prizes: As we made the draws, we donated sessions and included things with the sessions such as the anatomy cube, BodyTalk radio show DVD, Access book, and the Science and Philosophy of BodyTalk book, which provided the winner with additional information of the system. Follow up from Show: With our door prize slips, we asked the question, "Would you like further information?" which gave us permission to use their information to follow-up. We sent an email to everyone thanking them for attending the show along with a link to register for upcoming events that we had scheduled. We added a reminder of how to do cortices with a link to the website to watch the video explaining cortices which would also lead them to explore the website. Reward: Within 24 hours after the show, we had people registering online for all of the events, and the local practitioners were doing sessions on new clients. As we worked together over the weekend, we were asked if we all worked in the same location, and our reply was no. People were shocked and confused. We were there working as a team promoting a system without competition. As we reflected, our team there was an interesting observation that wasn't strategized. Our team consisted of myself, an Instructor who taught in the area, Tyla Johnston, a local Access Trainer and practitioner, Ashley Knutson, a local coordinator and practitioner, and Kathy Law, the most recent CBP in the city. This was a great example of building a team, supporting each other and forming a foundation of community within the area. I want to say a big Thank You to the IBA team for having such great tools, information, and resources for us to use. Having these resources available helped to make our booth look professional, and provided us with confidence and tools for people to follow-up with. Also, Thank You to my fellow colleagues for the invitation to attend. I left that weekend filled with gratitude and pride to be associated with such a supportive, enthusiastic team and system.